One problem people complain about with compact cameras, mirrorless cameras, and even low-end DSLRs with kit lenses, is that they can't get good low-light images when action is involved. That's because you have a ceiling ISO you don't want to go above (800 for me on most of the m4/3 cameras to date, though a few recent ones I’ll push to ISO 1600), and a slow kit lens (f/6.3 here). These two things produce longish shutter speeds in low light (1/80 here, which was actually slightly underexposed). You can still get good shots of action with slow shutter speeds, but you have to work for them and sometimes wait for them. 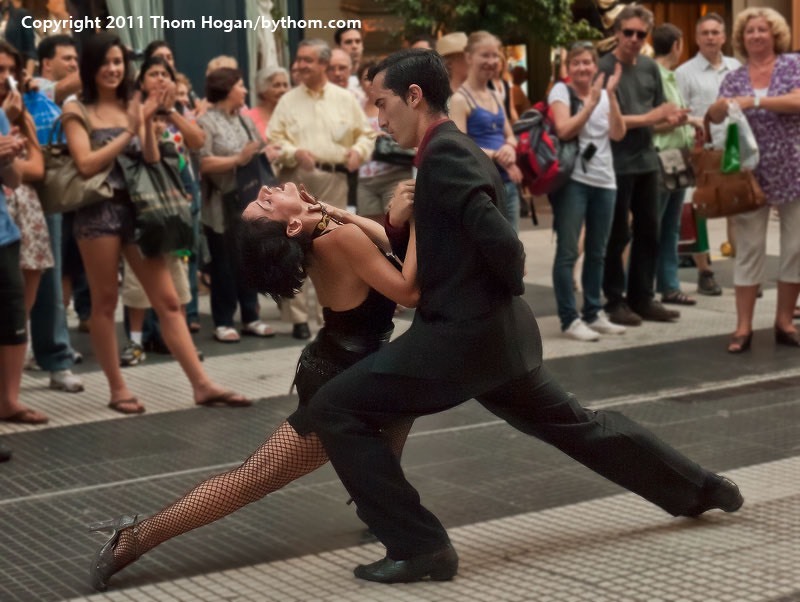 In this street tango, for instance, the dancers were moving pretty fast and furious most of the time. But the tango has "stops" in it, too, and so you just have to anticipate and wait for those moments where motion halts for the pose. Actually, it’s a bit more tricky than that. With dance you generally need to catch the last moment before the culmination point of the movement, otherwise you will start to see the collapse of the body position. I happen to like tango for practicing dance photography because the dancers often hold the culmination position of any movement just a tad longer. How do you know when those precious “pose" moments are about to occur? Diligent study. If this was the first time I'd seen a tango, I'd probably be late in snapping the shutter. But not only have I seen a lot of tangos over the years, I also watched this couple for three full sequences before I picked up the camera to shoot. By that point I had not only seen where they were doing their dramatic pauses, but I also was able to scout angles (and yes, this is the best of the angles I had available—the rest were even more cluttered or totally inappropriate). Some people think that candid photography like this is "fast." You just walk into the scene and react. Sometimes that's the case, but as with most photography, taking a little time almost always results in a better picture. Now if I could only bend like that while taking pictures ;~).